Please join us — DC Dutch, Baltimore-Rotterdam Sister City Committee, the Netherlands Embassy, the Netherland-America Foundation, the Netherlands America Chamber of Commerce for the Washington Metro Area, BrettonWoodsNL, and Dutch District Drinks — for a special Baltimore edition of our regular happy hour! Location: Little Havana restaurant/bar, located on the south side of Baltimore Inner Harbor, in their private room with access to an outdoor courtyard. Admission: Free; cash bar. Please RSVP so that we can get a headcount. 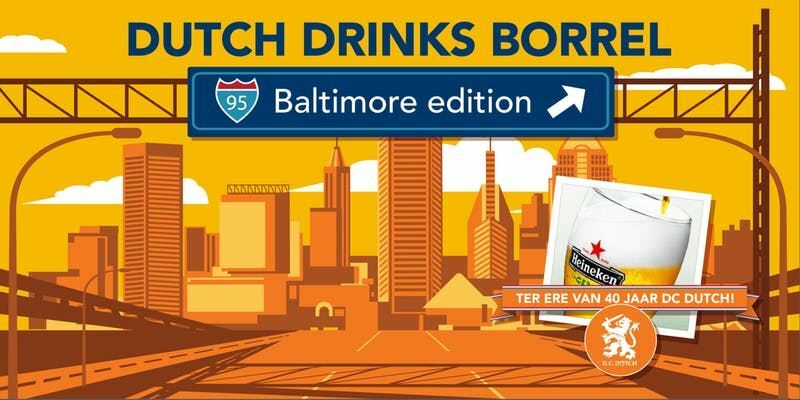 Baltimore-Rotterdam Sister City Committee and DC Dutch are hosting this borrel to mark the 40th anniversary of the DC Dutch organization. Wear your orange and come celebrate with us! De borrel is in het teken van het 40 jarig lustrum van DC Dutch, de Nederlandse vereniging in de Washington, DC metropool regio. Draag iets oranje en vier met ons mee! Please register here Baltimore borrel!